The South African Physical Sciences Curriculum and Assessment Policy Statement (CAPS) requires learners to develop science inquiry skills, including Integrated Science Inquiry Skills (ISIS). However, the performance of learners in assessment tasks related to ISIS has been consistently poor over several years. The use of ineffective pedagogical methods to develop practical skills could partly account for this poor performance. This study compared the effectiveness of individual and group practical investigations in developing ISIS in learners. The study involved 319 purposively selected Grade 11 Physical Sciences learners in Limpopo Province, South Africa. A mixed-method approach was used to collect data. Pre- and post-tests, and practical reports were used to assess learners' competence in ISIS, while a questionnaire provided information about their opinions regarding the investigation methods used. A comparison of the performance of the two classes of learners showed no significant difference in their overall competence in ISIS. Qualitative analysis of the practical reports and learners' opinions revealed some discrepancies between the two investigation classes. The results suggest that the two approaches to practical investigations are approximately equally effective in developing learners' overall ISIS. Competency in science inquiry skills enables individuals to design and conduct scientific research in order to develop effective solutions to the problems which they encounter as they interact with their environment (Harlen, 2014). Several scholars (Bhagat, 2017; Harlen, 2014) associate scientific literacy, creativity, innovativeness and the ability to solve day-to-day problems, with competency in science inquiry skills. These skills are particularly important in contemporary communities where there is prevalence of socio-economic problems and a high demand for technological advances. It is therefore crucial for the youths, worldwide, to acquire science inquiry skills, irrespective of their nationality or socio-economic status. Science inquiry skills, also known as science process skills, are "a set of broadly transferable abilities, appropriate to many science disciplines and reflective of the behaviour of scientists" (Ismail & Jusoh, 2001:68). Science inquiry skills are categorised into basic and integrated science inquiry skills. The latter skills assimilate a number of the basic skills (Turiman, Ormar, Daud & Osman, 2012), which makes them higher order thinking skills. In science teaching and learning, learners acquire science inquiry skills through participation in practical investigations, which allow them to carry out activities that test hypotheses for observed phenomena. Many researchers (Harlen, 2014; Osman, 2012) advocate for the development of science inquiry skills in learners. Consequently, many education systems worldwide promote the use of practical investigations to develop inquiry skills, in addition to enhancing the conceptual understanding of science. For instance, the United Kingdom national curriculum (Attainment Target 1 for science) emphasised the use of scientific investigations (Department for Education and Employment, 1999). Similarly, in the United States of America, the American Association for the Advancement of Science ([AAAS], 1993) project encouraged inquiry investigations in science classrooms. "Practical investigations should be performed on a regular basis and emphasis should be placed on the investigative question, the hypothesis, variables, method, results, interpretation of results and the conclusion " (DBE, 2012:188). There appears to be consensus among science education scholars and education departments that practical investigations are pivotal to learners' development of science inquiry skills. However, there is little clarity on appropriate pedagogical strategies for developing these skills during practical investigations. This study was therefore an attempt to explore the effectiveness of two pedagogical strategies used to develop ISIS during practical investigations. The South African Physical Sciences CAPS document emphasises the development of ISIS such as: formulating hypotheses, identifying, controlling and manipulating variables, operationally defining variables, designing and conducting experiments, collecting and interpreting data, and solving learner problems (DBE, 2012). Despite this emphasis, the 2011 and 2012 Grade 12 national diagnostic reports on learner performance in Physical Sciences showed poor performance in questions assessing competence in science inquiry skills (DBE, Republic of South Africa, 2011, 2012). Poor performance in questions related to inquiry skills suggests learners' lack of higher order thinking skills, and contributes to their overall poor performance in science subjects, which has been the norm in South Africa for a long time. The use of ineffective teaching and learning methods during practical investigations could partly account for the poor performance in questions related to inquiry skills. To this effect, Science Community Representing Education ([SCORE], 2008) suggests that practical work, when done well, can stimulate and engage learners at different levels, challenging them mentally and physically in ways that other science experiences cannot. It appears that effective pedagogical approaches are necessary for stimulating learners' thought processes, including the development of science inquiry skills, during practical investigations. Unfortunately, Ramnarain and Schuster (2014) noted that, despite the worldwide emphasis on inquiry-based pedagogy in science curricula and educator preparation, its implementation has varied across educational landscapes. They attribute this variation to several factors, including resources, curriculum constraints placed on educators, educational and cultural backgrounds of educators and learners and class size (Ramnarain & Schuster, 2014), which are evident in the South African context. These factors could influence the choice of pedagogical approaches used during practical investigations. The teaching methods commonly used to develop science inquiry skills include demonstrations, individual practical work, group practical work and computer-simulated experiments (Feyzioglu, 2009:115). In the South African context, the frequently used approaches for practical investigations include demonstrations, individual investigations and group investigations. Historical factors could account for the choice of practical investigation approaches used by South African educators. South Africa has experienced a diversity of educational reforms, including a transition from the racial discriminatory apartheid education system, which favoured the white minority while actively oppressing the black majority, to an integrated national education system. One of the objectives of the post-apartheid education system was to redress historical educational imbalances (Ramnarain & Schuster, 2014). Efforts to equalise educational opportunities for all learners resulted in a high demand for educational resources, especially in science classrooms, such as qualified science educators, laboratories and resources for practical investigations. This is especially true for previously disadvantaged schools, which remained poorly resourced, with scant facilities for practical work in Science (Ramnarain & Schuster, 2014). Insufficient resources are likely to have influenced the selection of pedagogical methods used during practical investigations in South African science classrooms. Ramnarain and Schuster (2014) found, from interviews with educators, that contextual factors such as class size and availability of resources influenced the pedagogical orientations of South African educators. SCORE (2008) posits that educators sometimes behave as if the reason for group practical investigations is that there is insufficient equipment for learners to work individually. Educators might therefore resort to group practical investigations to avert the problem of insufficient resources, rather than use the approach as an effective alternative way of teaching practical investigations. Such educators might not appreciate the strengths of group practical investigations in developing essential scientific and interpersonal skills (SCORE, 2008). Several researchers (Dudu & Vhurumuku, 2012; Motlhabane, 2013; Mudau & Tabane, 2015; Ramnarain & Schuster, 2014) have conducted studies on practical investigations in South African Physical science classrooms. Although these researchers looked at what transpires during practical investigations in science classrooms, there has been little focus on the comparison of the effectiveness of individual and group practical investigations in developing science inquiry skills. Hence, it is not clear as to whether either of these approaches is more effective in developing science inquiry skills. It therefore became necessary to explore the comparative effectiveness of these two practical investigation methods, in developing ISIS. The following research questions were investigated. 1. Is there a significant difference between learners exposed to individual practical investigations and those exposed to group practical investigations in their development of integrated science inquiry skills? 2. What are the opinions of learners exposed to the two practical investigation methods regarding their effectiveness in developing integrated science inquiry skills? The null hypothesis that "There is no significant difference between learners exposed to individual practical investigations and those exposed to group practical investigations in their development of ISIS at 95% confidence level," was tested to explore the first research question. Principles of radical and social constructivism guided this study. Radical constructivism is premised on the notion that "The construction of meaning out of the world is an individual mental process" (Belbase, 2014:100). Based on this theoretical framework, a class of learners was exposed to individual practical investigations in this study. These learners interacted with the investigated phenomena and created their own meanings and interpretations. Social constructivism suggests that "knowledge is first constructed in a social context and is then internalized [sic] and used by individuals" (Amineh & Asl, 2015:13). In the same vein, in this study, another class of learners participated in group practical investigations, where they cooperatively designed and conducted investigations, and formulated conclusions as a team. During the investigation, learners shared responsibilities, resources and ideas. Subsequently, the competencies of the two classes of learners in ISIS were compared to determine the effectiveness of the two learning approaches in developing the skills. A mixed-method research approach (Creswell, 2009) was used to collect data in this study. A comparative experimental design (Kumar, 2011) was used to collect the quantitative data for comparing the effectiveness of individual and group practical investigation methods in developing learners' ISIS. A questionnaire was used to obtain learners' opinions concerning the effectiveness of the two methods in developing ISIS. Three hundred and nineteen (319) Grade 11 Physical Sciences learners, comprising 138 males and 181 females were purposively sampled from four rural schools to participate in the study. The schools are located in Limpopo province, one of the poorest provinces of South Africa. Learners from these schools hardly participated in practical investigations prior to the study, because the schools are poorly resourced. Learners from each of the four selected schools were randomly assigned to either the individual or group practical investigation classes. Learners in the former class conducted investigations individually, while those in the latter worked cooperatively during investigations. The participants in individual and group practical investigation classes were 79 and 240, respectively. The group practical investigation sample was three times bigger than the individual one, because each investigation group set comprised three learners. Data Collection and Analysis Quantitative data were collected by administering pre-tests and post-tests to the participating classes using a Test of Integrated Science Process Skills (TISPS) developed and validated by Kazeni (2005). The instrument consists of 30 multiple-choice items based on Natural Science content. The test items assess learners' competence in the ISIS of formulating hypothesis, identifying and controlling variables, operationally defining variables, designing and conducting experiments, graphing, and interpreting data. Initially, a pre-test (TISPS) was administered to the two classes. Thereafter, they were exposed to two sequentially conducted Natural Sciences-based practical investigations. The first practical investigation was based on Physics content, and it required learners to design and conduct an experiment to determine the relationship between the length and the period of a pendulum. The second practical investigation focused on Chemistry content, where learners were asked to design and conduct an experiment to determine the relationship between the concentration of hydrochloric acid (HCl) used and the amount of heat produced from a reaction between hydrochloric acid (HCl) and zinc (Zn). Both experiments required learners to apply the ISIS investigated in the study. In order to minimise learners' development of the investigated ISIS from subsequent theory-based lessons, the two investigations were conducted within a period of two weeks. The study process and objectives were explained to all stakeholders, and their consent was obtained. Both investigations were conducted after normal school time to avoid the disruption of regular schooling, and to ensure the participation of learners in the randomly constituted classes. At the end of each practical investigation, individual from the two classes submitted one investigation report, based on a specified report-format. After the second investigation, the TISPS was administered to all the participants, as a post-test. The inferential statistic of independent sample t-test (using the Statistical Package for Social Sciences [SPSS] programme) at a critical value of a = 0.05, was used to compare the competence of the two investigation classes in ISIS. First, mean scores of individual and group investigation classes in the TISPS pre-test were compared in order to establish whether there was a significant difference in the competence of the two classes in ISIS before the intervention. Second, the TISPS post-test mean scores of the two classes were compared to determine the impact of the treatments on learners' development of ISIS. Finally, the mean scores of the two classes in the practical reports were compared to further determine whether there was a significant difference in learners' competence in ISIS, as a way of triangulating results from the TISPS posttest. Figure 1 shows these performance comparisons. Qualitative data were gathered using a questionnaire, which consisted of open-ended questions, based on six pre-determined themes. The themes are: learners' interest in the assigned learning method, perceptions about the effectiveness of the assigned learning method in developing ISIS, opinions about their competence in science content, views on their development of ISIS, opinions regarding their performance on the pretest and post-test, and views regarding the challenges of conducting practical investigations. Learners' responses to questionnaire items were first coded and categorised into the above stated themes. Second, two researchers separately compared responses from the two investigation classes. Finally, the qualitative responses were compared with the quantitative results. The quantitative data comprised of TISPS and investigation report scores. The TISPS was assessed out of 30 marks, while the two investigation reports were assessed out of 32 marks (16 marks for each investigation). Comparisons of performance in the test of integrated science process skills The overall pre-test performance of individual and group investigation classes in TISPS showed M of 12.86 (SD 4.104) for the individual investigation class and 12.34 (SD 3.956) for the group investigation class. Table 1 displays the independent sample /-test comparison results (t = 1.002; df = 317, two-tailed p = 0.317, at a = 0.05). The p-value of 0.317 is more than the critical value of a = 0.05, which means that there is no significant difference in the competence of the two classes in ISIS. A comparison of the performance of the two classes in the specific ISIS also showed no significant differences. This result implied that any differences observed in the competences of the two investigation classes in ISIS after the intervention could be attributed to the different learning approaches used, if other variables are kept constant. The overall post-test TISPS mean scores for the individual and group investigation classes were 12.90 (SD 4.779) and 12.52 (SD 4.001) respectively. A statistical comparison of these mean scores showed an insignificant difference between the two classes in the development of ISIS, as evident from Table 2 (t = 0.641, df = 116.132, two-tailed p = 0.523, at a = 0.05), where the p-value of 0.523 is greater than the critical value of a = 0.05. Comparison of the performance of the two classes on the specific ISIS also showed no significant differences. The post-test TISPS results therefore support the null hypothesis that there is no significant difference between learners exposed to individual investigations and those exposed to group investigations in their development of ISIS. An inspection of the mean scores of the two investigation classes in practical investigation reports revealed a slight difference of 0.979, in favour of the group investigation class (M 20.169; SD 7.329 for group investigation class and M 19.190; SD 6241 for individual investigation class). However, statistical comparisons showed no significant difference in the performance of the two classes, as shown in Table 3 (t = 1.066, df = 317, two-tailed p = 0.287, at a = 0.05), where the p-value of 0.287 exceeds the critical value of a = 0.05. The result of the quantitative statistical analysis of the investigation reports is therefore consonant with the findings from the TISPS posttest comparison, which showed non-significant differences in the mean scores of the two classes. Practical investigation reports were analysed qualitatively, as well as questionnaire responses, to obtain insights into the development of ISIS by the two investigation classes. Regarding the first practical investigation, the qualitative data revealed that on the one hand, learners from both classes were able to identify variables, operationally define them, and to provide correct hypotheses for the experiment. On the other hand, learners from both classes did not show competence in experimental design and graphing skills. Most learners from both classes could not provide all the apparatus and materials needed for the experiment. Furthermore, their investigation reports showed incomplete experimental procedures. Learners from both classes could not draw the 'line of best fit' properly. The interpretation of graphs also seemed to be a challenge for both classes. Figures 2a, from the individual investigation class and 2b, from the group investigation class illustrate these observations. 238YGF - "The graph shows a general trend to exist when the string length is shorter than the time taken is less." 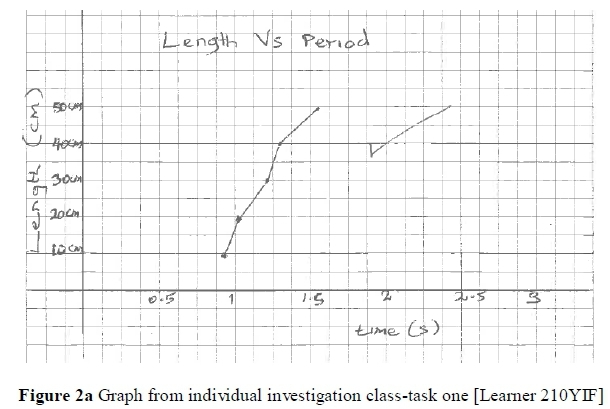 Practical reports from investigation task two showed some improvements in learners' graphing skills, especially those from the group investigation class. More than 70% of the learners from this group labelled their graphs and drew the 'lines of best fit' properly. They also interpreted their graphs correctly. Figure 3, which is an excerpt from the group investigation class [by learner 050SGM], shows some of these improvements. 050SGM - "When concentration of the reaction increase the temperature also increase. The temperature and concentration of the reaction are directly proportional?" 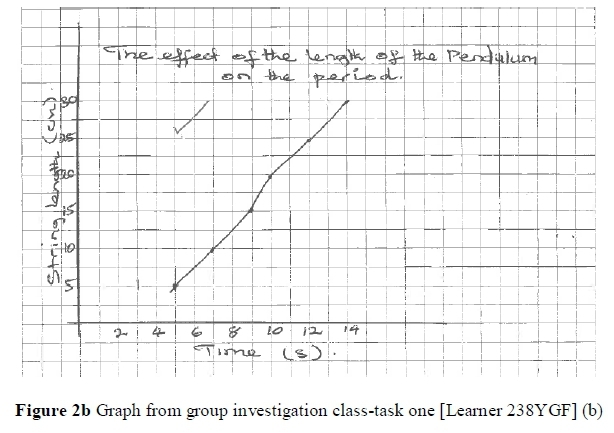 Although some individual investigation learners also showed some improvement in graphing after the second investigation, as shown in Figure 4a [by learner 270NIF], more than half of the learners from this group still had challenges with this skill. 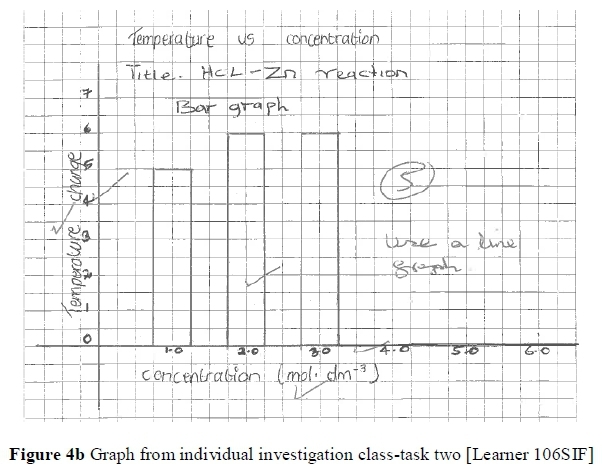 Most of them could not record the variables and their units correctly, while others drew inappropriate graphs, as illustrated in Figure 4b [by learner 106SIF]. It also seems that learners from the individual class learners improved on their ability to interpret results, despite some grammatical errors, as illustrated by the interpretations in the following quotations. 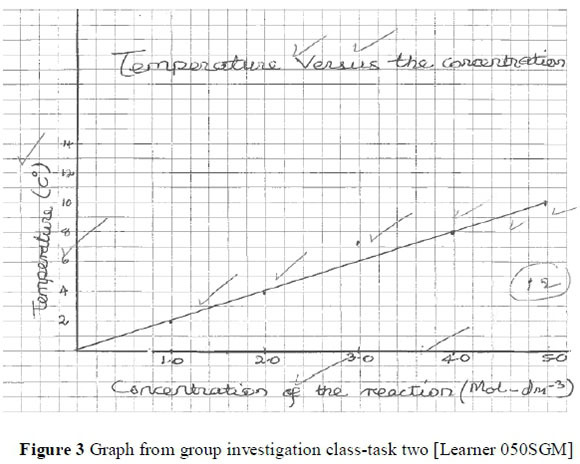 For Graph 4 (a): 270NIF " When concentration increase the temperature also increase"
For Graph 4 (b): 106SIF " When the concentration increases, so does the temperature. They all increase as they go together"
In summary, the qualitative analysis of the practical investigation reports revealed that the overall performance of the two classes in the investigation reports was approximately the same, which supports the TISPS post-test findings. Nonetheless, an analysis of specific ISIS showed that the quality of graphs from the group investigation class was slightly better than that of the individual class. Questionnaire responses were analysed in order to address research Question 2, which explored the opinions of learners regarding the practical investigation method used. The analysis focused on understanding learners' perspectives regarding the six pre-determined themes presented in the subsequent texts. Interest in assigned practical investigation approach Learners from the individual investigation class expressed interest and enthusiasm at doing practical investigations as individuals, citing autonomy as the most exciting part of the investigations, as evident in the quotations below. 179HIF - "It as a great achievement to be able to do things on your own [...], it also gains self-confidence and independent." 285NIF - " What I enjoyed was that I had to do the experiments on my own, without any 1 's help. That I had to also manage the time given. And that I had to know what to do when dealing with chemicals and other dangerous substances, so that I could not hurt myself"
The group investigation class also expressed enthusiasm in the method use. According to this class, social interactions within the groups and peer assisted learning were the most interesting experiences, as expressed in following quotations. 295NGF - "Doing practicals as a group, being corrected by peers, that, what you are doing is wrong or right was very good"
238YGM - "When you work with other people, you learn more that you would not have had if you worked alone, because in a group, you share ideas." Evidently, learners from both investigation classes appreciated the investigation method assigned to them. Perceptions on the effectiveness of assigned learning method in developing ISIS Learners from the individual investigation class seemed to have conflicting views regarding the effectiveness of the two learning methods. About half of the class felt that individual practical investigations were more effective in developing ISIS, while the other half preferred group investigations. On the contrary, almost all the learners from the group investigation class maintained that the method they were exposed to was more effective in developing ISIS. The learners who preferred individual practical investigations indicated that working as individuals encourages hard work and independence, which are required during examinations and that one, has control over his/her activities. Those who favoured group investigations cited sharing of ideas, learning from one another and correction by group members as some of the advantages of group investigations. These results suggest that both individual and group investigation methods have strengths, which could enhance the development of ISIS. The two classes indicated that they had achieved a good understanding of science content, especially regarding unfamiliar science terminology and concepts, after the investigations, as stated in the example below. 284NIF - "There is a difference, before the investigation there were much terms I didn't understand, but after the investigation I almost know (all) those term I didn't know before. I observe it clearly, not for seeing it in a textbook and I understand more things on those investigations"
In most cases, however, learners did not specify the science content, which they claimed to have learned. They gave vague answers such as the ability to understand science clearly. In addition, some learners failed to distinguish between practical investigations and science content, as they used these terms interchangeably. 219YIF - "I gained more skills of how to carry experiments, how to answer questions, handling apparatus in an admired way. And also interpreting observations in form of graph and theory"
284NIF - "I learned measuring temperature, measuring the speed and using a stopwatch to determine rate, speed or temperature after a certain time ... ."
185NIF - "I think that on my first (test) I tried because I wrote it before I did an investigation. But with the second test I think I have improved because I had done an experiment, I had the idea on how to answer the questions"
270NIF - "My first test wasn't that good but the second test was very good and I think is because I' ve gained knowledge after the first and then improved my performance." These views contrast with the findings from the pre-and post-test comparison, which showed insignificant differences in learner performances. Learners from both investigation classes expressed difficulties related to the collection and recording of data. They were also apprehensive about the unfamiliar scientific terms and concepts used during the investigations. Once again, the learners did not provide details of the specific challenges encountered in the cited issues. The results of the study showed insignificant differences in the competence of learners exposed to individual and group practical investigations, in the science inquiry skills investigated. This finding is not unique to this study, as some international studies (Rezba, Sprague, Fiel & Funk, 1995) also found lack of significant differences in the mean scores of learners exposed to different investigation methods. This finding is pertinent to science educators, especially those from under resourced schools, who might perceive individual practical investigations to be more effective in developing inquiry skills and scientific content knowledge than group investigations. Many educators, as pointed out earlier, consider group investigations to be a strategy for averting the problem of insufficient resources for practical work (SCORE, 2008). These educators see the lack of resources for practical work as an impediment to conducting effective practical investigations. In light of the prevalence of insufficient resources in most rural schools in developing countries, including South Africa, it is imperative for science educators over the world to appreciate group investigations as an effective alternative method for developing inquiry skills and science content (SCORE, 2008). An appreciation of the strengths of group practical investigations in developing scientific content and skills could encourage science educators in rural schools, worldwide, to involve their learners in practical investigations, in spite of resources shortages. The results from this study ought to instil confidence in educators to use either of the investigation approaches or both, to conduct practical investigations, as they seem to be equally effective in developing science inquiry skills. The findings also revealed insignificant differences in learners' pre- and post-test competence in ISIS. A number of factors could account for this lack of significant differences. For instance, some group members might have selected to work alone despite being in a group, hence forfeiting the benefits of group work (Tosun & Taskesenligil, 2013). It might be necessary to explore ways of ensuring that group members actively interact with one another during group practical investigations. Limited exposure to practical investigations may have been another contributing factor to learners' insignificant improvement, since the participants conducted only two investigations over a short period. This assumption corresponds with Lati, Supasorn and Promarak's (2012) findings that students who had less practice in science inquiry skills did not develop the skills adequately. Pollock, Chandler and Sweller (2002) also suggested that time of exposure to practical investigations could influence the effectiveness of the learning methods used to develop ISIS. Therefore, another study aimed at determining the amount of exposure required to develop learners' ISIS using practical investigations is necessary. This is particularly important, considering the worldwide need to develop learners' science inquiry skills (SCORE, 2008). 284NIF - "... Some of the terms/concepts that were used in the test of ISIS were difficult, as I don't know what they mean. Or I couldn't define them"
Finally, the inability of learners to transfer developed skills to other contexts, such as from practical activities to the paper and pencil test used to assess them, could also account for the insignificant differences in learner performance in pre- and post-tests. In this respect, Saat (2004) found, in his study of 'The acquisition of integrated science process skills in a web-based learning environment,' that learners were at times unable to apply developed skills in different contexts. The qualitative results seem to portray a positive picture regarding the effectiveness of the two investigation methods in developing ISIS. For instance, learners from both investigation methods found the method to which they were exposed to be interesting. Although learners attributed their interest in practical activities to the learning methods used, it is possible that they were excited about conducting investigations regardless of the approach used. According to Abrahams and Reiss (2012), learners generally perceive practical investigations to have affective value. Contrary to the quantitative findings, learners vaguely indicated that they achieved a good understanding of science content, terminology, and concepts, and that they acquired new science inquiry skills. Despite the vagueness of these claims, learners seemed to appreciate both individual and practical investigation methods, although the group investigation method was popular. The discrepancy between learners' actual performance and their perceived performance could be explained on the premises that learners frequently view practical investigations as both affective and effective (Abrahams & Reiss, 2012). In this regard, learners might have been interested in the practical tasks and assumed that their interest translated into achievement. Other researchers (Kazeni & Onwu, 2013; Musasia, Abacha & Biyoyo, 2012) have reported similar results, where learners were confident that they had developed science inquiry skills after conducting practical investigations, which suggests that learners' perceptions about their performance might not always reflect reality. The quantitative findings from this study revealed that the competencies of learners exposed to individual and group investigations in ISIS were statistically similar before and after the practical investigations. This finding suggests that neither of the learning modalities used was more effective in developing learners' integrated science inquiry skills than the other. A qualitative examination of practical reports showed that, after the second investigation, learners from the group investigation class performed slightly better in graphing, recording of results, and interpretation of graphs than those from the individual class. 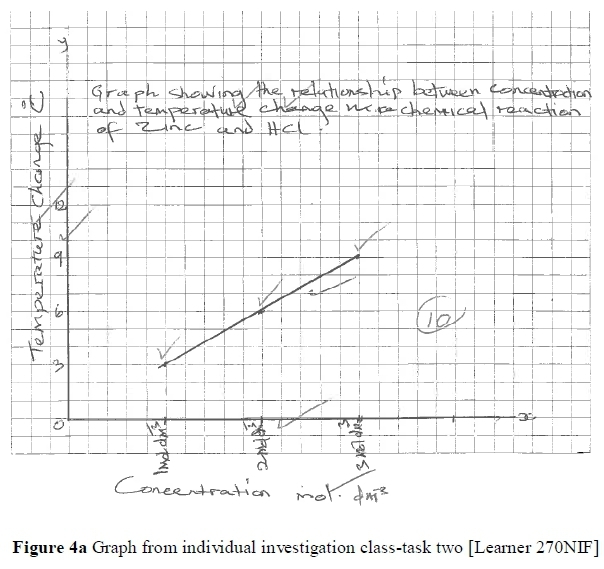 This observation suggests that leaners from the group investigation class somewhat benefited from cooperative learning, as suggested by Rapudi's finding (2004) that cooperative learning could have a positive influence on the development of graphing skills. Learners' opinions regarding the two investigations methods suggest that both methods have merits in developing science inquiry skills and content knowledge. Group investigations seem to promote peer assisted learning, the socialisation of learners and interpersonal skills, while individual practical investigations appear to instil autonomy, confidence, and hard work in learners. This finding is consistent with assertions from SCORE (2008) that both individual and group investigation methods are important in developing scientific and interpersonal skills. It is therefore recommended that educators use the strengths of both investigation methods for a holistic development of learners. The findings from this study should be understood within the contexts of learners' limited exposure to practical investigations. A follow-up study carried out over a longer period is needed to corroborate the results of this study. Eddy Baloyi conducted this study under the jurisdiction of the University of Pretoria.